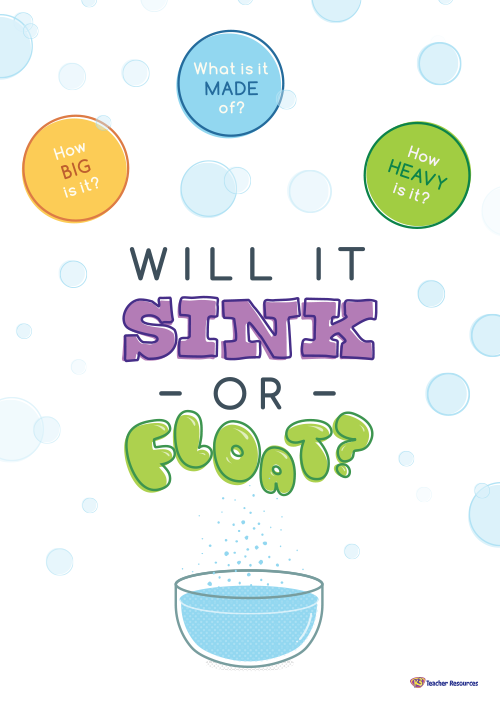 A poster and T chart to use when exploring whether objects sink or float. Ideal to use when exploring whether objects sink or float. Prepare the area to be used for this investigation. Fill a large container with water and assemble a collection of objects for students to experiment with e.g. paper, plastic spoon, metal spoon, key, sponge, apple etc. Display the Sink or Float Poster. Use the questions on the poster as prompts for discussion. Students draw or write the names of the objects in the appropriate columns of the T chart. Alternatively, the chart could be laminated and the actual objects placed on the chart in the appropriate columns.